My short satire piece “The Very Strange Weird of Endart Sscowth” is forthcoming this summer in Space and Time #114. You Clark Ashton Smith fans (and Battlestar Galactica fans!) may recognize some of it. Underneath my fellow Odyssey grad Larry Hodges, who earned the top billing. It’s actually the second time that Larry and I have shared a TOC in Space and Time. He had a piece opposite my story “Ebb” in S&T #107. So check out S&T #114 this summer, and grab a copy of #107 if you don’t have it already. Larry’s eager humor and my strange worlds both lie within. It’s Nebula Award nomination season again, when any Active or Associate member of SFWA can nominate works for the Nebula Awards. My short story “Ebb,” from Space and Time #107, is eligible. It’s a neat little story, with an interesting protagonist and a subtly fascinating world, and it garnered glowingly positive reviews from both Tangent Online and SFReader.com. Should you feel it worthy, I would appreciate your nomination. I also direct you to my magazine Beneath Ceaseless Skies. Because of the date range for Nebula eligibility, all the stories BCS has ever published are eligible. For a shortlist of our best-reviewed stories and the Nebula categories they fall into, click here. For a full list of all stories and their Nebula categories, click here. Capclave has slick links to personal schedules for each program participant. Here’s mine. At my reading Friday at 9:30, I will read from “Ebb,” my story that was in Space and Time last spring. At the panels on magazines and new media, I will have some interesting takes on those ideas based on my online mag Beneath Ceaseless Skies and how we use podcasts of short stories. The Sunday panel, on paranormal romance and urban fantasy, I’m not sure I will have a whole lot to contribute. :) So I may be mostly moderating what the other panelists have to say. If you see me at the con, by all means introduce yourself and say hello. 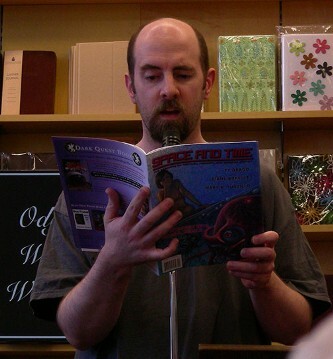 Two weeks ago, I read from my short story “Ebb” at the TNEO 2009 Flash Fiction Slam at the Barnes & Noble in Manchester, NH. That story, in the summer issue of Space and Time, has gotten some great reviews. TNEO is a week-long workshop for alumni of the Odyssey Writing Workshop, which includes me and my Homeless Moon cohorts and many other great young writers.